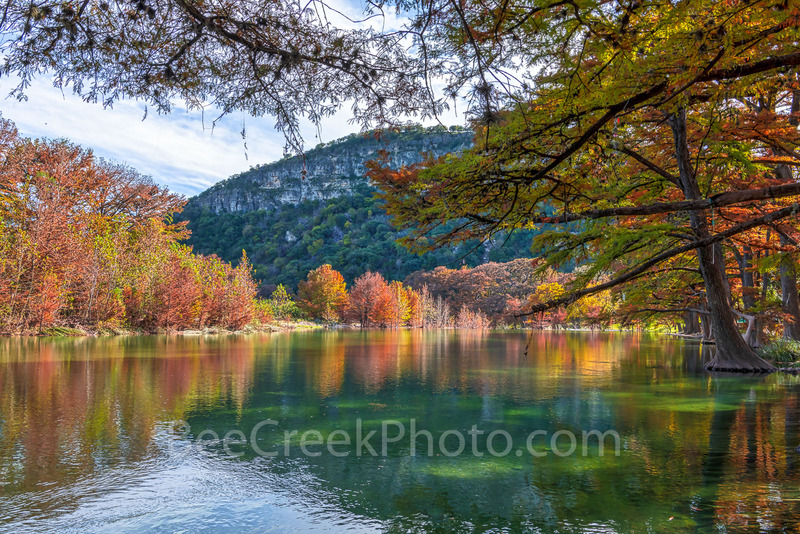 Fall at Garner State Park - Texas Landscape Fall Prints and Canvas - The long branches of the bald cypress trees stretch out their limbs over the Frio river as it flows downstream toward the Old Baldy before it makes a turn downstream. You can see the fall rusty red colors in the cypress trees along the bank of the Frio. The sun was shining on the other side and you can see the color changes of the maples and reflect the colors back into the waters. After some heavy rains the water was flowing on the Frio river through Garner State Park so the cypress were in the water so I waded out into the cold waters and capture this image so I could capture Old Baldy in the back ground in this Texas Hill country landscape photo. We spend a lot of time trying to take the best pictures of the Texas Hill country. Photo © copyright by Bee Creek Photography - Tod Grubbs / Cynthia Hestand.